Pejivalle River Duckies are the perfect way to enjoy the breathtaking views and rapids of the warm Costa Rican waters of the Pejivalle River. Inflatable kayaks, known in Costa Rica as River Duckies, are the perfect next step for those who have experienced whitewater in a raft but are looking for their next challenge. The design of the Whitewater Duckies allows them to be much more maneuverable then a raft and easily powered by a single participant with a double sided kayak paddle. The Duckies also sit a lot closer to the water (and sometimes your actually sitting in the water) which allows each wave and river feature to feel a lot bigger then I may have in a raft. Our Duckies are big enough for two (have a guide join you or a family member for a lesson in team work) or can be easily paddled by them selves. If you do end up flipping your ducky there is no special sequence of events, like there is in a hard shell whitewater kayak, to free yourself. This allows the whitewater ducky to be incredibly safe for all participants, experienced or not. 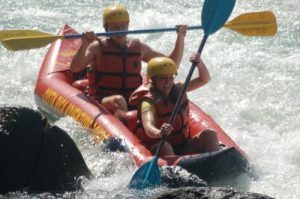 The Pajivalle River is a lower volume river compared to some of its other Costa Rican brothers, which is ideal to learn new mediums of how to enjoy whitewater. spectacle is sighting a Sun Bird. This elusive bird, with a very unique song, has a semicircle on each wing of bring yellow or orange that mimics a sun. 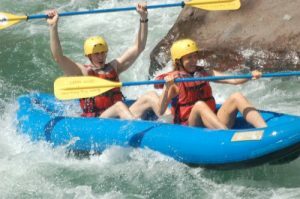 Come join us on our favorite river in Costa Rica for an adventure you won’t forget. Are you looking for just the overnight trip, not a multi-day custom adventure package?